I have been meaning to create a Facebook page for the blog for a while now. I have been chickening out of doing it for ages but finally this week have bitten the bullet and given it a ago. 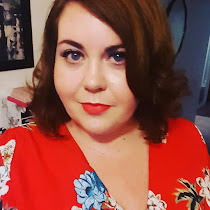 It is one thing doing a blog and posting it on Twitter etc, but Facebook can be and is a nasty machine at times and I knew that I would be opening myself up to a lot of potential criticism, particularly with regard to the plus size clothing and reviewing. Most of the people I know on Facebook have never heard of a blog before and the thought of posting photographs of yourself on there is an alien concept to most. Putting on my confidence shoes on however I created the page which can be found here! I've done the page primarily for photo posts and also in relation to body confidence issues. Now I have found confidence and self belief, I want to pass that confidence on to others, help other people find their confidence too. I've had some great feedback from the Facebook page from friends, from others I am not too sure about but time will tell. Maybe someone will see a post I write or something I wear and have confidence to think it or wear it themselves. Maybe they will, maybe I'm just putting all this out in the cosmos not doing much at all. But I'd rather try to do something then sit still, not moving forward.